It is an unfortunate reality in today’s world that random acts of gun violence do occur sometimes in work place facilities and offices. An active shooter is defined as an individual who is firing a weapon towards innocent people with the intent to kill, wound or terrorize within a confined area. In most cases, the victims of an active shooter are random targets. One of the most important strategies to guard against the harm that can be caused by an active shooter is a comprehensive and ongoing training program. The highly experienced and skilled professionals at P4 Security Solutions have decades of experience in specialized private security, law enforcement and elite military service. Our active shooter training is designed to be tailor fit to each unique customer’s business environment. The program’s primary goal is to preserve life and minimize the overall impact of such an event. It is a well-known fact that preparedness saves lives when these horrible occurrences happen. The active shooter response training program covers in great detail the following human protection strategies. Active shooter scenarios happen suddenly and can cause massive confusion, terror and the loss of clear thinking in victims. Maintaining a workplace active shooter training program for key personnel is essential to minimize the horrible consequences of these events. 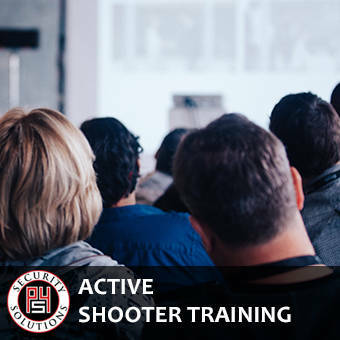 You can count on the experts at P4 Security Solutions to create and facilitate a custom made, active shooter training program, which will significantly decrease the chance of harm to employees. Contact us today to learn more about we have helped our clients prepare for the possibility of such an event.